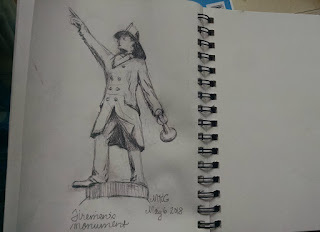 Remember my adventure Urban Sketching? Today I went back to Forest Lawn Cemetery and I did some more drawing. It is very relaxing and sets a nice tone for the week ahead and all the work I am buried in, you know? Speaking of burying, I have gotten more used to Forest Lawn. Once when I had to go for work a couple of years ago, it upset me being in there and I could not wait to get out. But now I kind of like it. I like it because there are things to draw and it is quiet. Yesterday I went for a walk in Delaware Park and it was so loud and I kept hearing the "F" word. At the cemetery there is hardly anyone. Not only that but there are all these rules about you have to behave with respect to let people rest in peace. You can hear the birds and the splashing of the water! 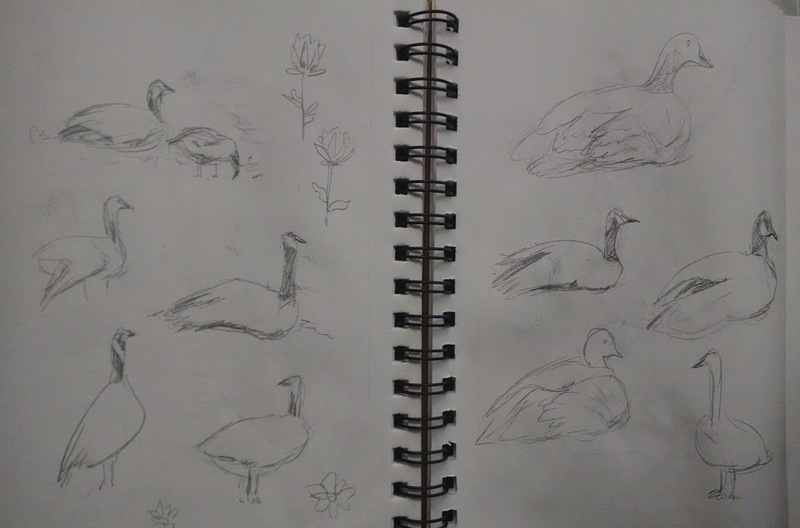 I drew the Schoellkopf memorial and then I drew a bunch of geese. 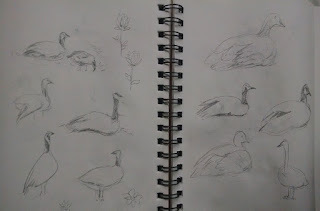 Then I drew more geese. I am getting good at drawing geese! They are fun. I love the big fat shape of them. Then I was going to leave because hours had passed and I was hungry. But on the way out I saw the Volunteer Firemen's Memorial and so I stopped and gave it the old college try. That is it at the top of the post! You get absorbed when you are working and at one point I was so excited because I saw the firemen's coat coming into focus that I realized I was actually drawing with my mouth wide open. It is such a beautiful statue and such a pleasure to draw. When I was through I got up and took a closer look at the statue. They put it up in 1901. On the side of the monument, beneath the fireman, there were inscriptions and I began to read them. It turned out they listed firemen who died in some 19th century fires. One was the American Hotel, in 1865. They listed a number of men who died in that fire. There were a few other fires too but that was the big one. All the firemen they listed were in their 20s. I backed up and took a look at the graves surrounding the monument I had just sketched. I started doing the math. Almost all of them were in their 20s or 30s. A few were in their 40s and 50s. I was surrounded by the graves of firemen who had died fighting fires! Son of a sea cook, I started to cry!! This is why you do not go to cemeteries. Let us say a prayer for those brave firemen and then move on. We can always cheer ourselves up by looking at my pictures of geese. Honk if you love geese! Haha, could not help that. Next time I was thinking I could try drawing the Red Jacket statue, except he is right near the entrance and everyone would be looking at me. I saw some angels that looked interesting. And when the chips are down there are always the geese. Comic relief in the cemetery. I love this Mary! I want to recover notification or at least you could post this link on FB for all of us to enjoy. I love your blog! Libby, so sweet of you!! I am trying to pick the blog back up because I used to have so much fun with it -- also it chronicles all kinds of stuff I would have otherwise forgotten. I am so honored you would like to receive notification when I post something -- I will have to figure out how that works!